Sunday is the last day for the Tour de France and I'm definitely going to miss it. 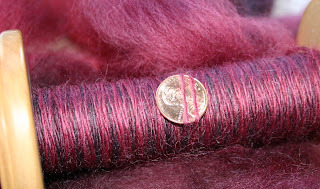 I've spun every day for the past 20 days - and have the yarn to prove it. During today's ride, I finished spinning and plying the BeeMiceElf Blue Ridge (photos tomorrow when I have some daylight to work with) and started on the New Zealand Romney I bought from Rocket Yarn. Romney is a coarser fiber, not nearly as soft as the BFL and Falkland I've been spinning, which is why this ended up near the bottom of my Tour queue. I shouldn't have waited. This stuff is nice. The colors are deep and rich - my favorite shades of red - and it drafts and spins like a dream. 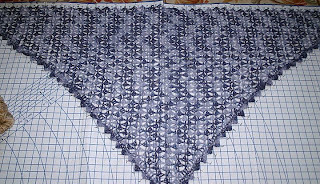 I also finished crocheting the supposed-to-be beaded-but-it's-not wrap and blocked it this evening. I changed the border edging from chain stitch loops to 5-dc shells. 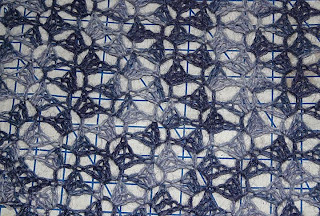 Very pleased with how it turned out and how the blocking opened up the stitches. I'm still planning to wear it tomorrow to my spinning guild (please, please don't let it be 100 degrees. . .) More photos tomorrow.